LaTreice Branson plays the congas during her Drum Like a Lady performances at the Great Stair Hall at the Philadelphia Museum of Art. LaTreice Branson always brings an extra drum or two to her performances — just in case someone wants to join in. “We always bring more than we need,” she said one recent Friday evening, tapping her silver cane on the stone floor of the Philadelphia Museum of Art, only a few hours before she and four women with her were to fill the Great Stair Hall with cathartic clangor. They call themselves Drum Like a Lady. Their goal is to provide a safe space for players of all ages and backgrounds to experience the joyful, healing power of percussion. Branson’s own memories of drumming are shaped by this power. Growing up, she and her sisters practiced rhythms on phone books until they could drum on bongos — then they practiced on bongos until they could play their mother’s silver drum kit. But while home was supportive, the world she found outside was inaccessible and unwelcoming. Male percussionists questioned her teachers, her aptitude, and her experience. In 2013, Branson founded her collective, which she describes as “led by women, rooted in improvisation, and grounded in percussion.” Today, Drum Like a Lady is composed of over 50 rotating performers. It’s collaborated with local groups like Kyo Daiko and Batalá, hosted jam sessions at the West Philly bar Dahlak Paradise, and carried the beat at the Philadelphia Women’s March for the last three years. Jan Jeffries, 65, calls herself a “woman of rhythm." The lead player of the Music Over Matter percussion group, she says Drum Like a Lady gives its players what Branson originally sought: the opportunity to explore self-expression in a supportive space. LaTreice Branson's Drum Like a Lady performance at the Great Stair Hall at the Philadelphia Museum of Art on Friday, March 29, 2019. Since then, she’s battled both physical and mental health problems. She struggles with bipolarity and anxiety, among other disorders. She wears a back brace and fights chronic pain in her legs and feet due to osteoarthritis and spinal disc degeneration. Some days, it’s hard to sit, stand, and move. But when she plays, she says, the pain disappears. In past years, Drum Like a Lady has hosted workshops for girls at Camp Sojourner, taught the elderly with the New Jersey Commission for the Blind, and served youths at Project Elijah Empowering Autism. Branson’s goal is to help communities around Philadelphia experience communal wellness through the act of drumming. Francis once led a girls’ band named Better Days, which toured as part of USO performances in the 1990s. But 25 years ago, a major car accident left her with head injuries that challenged her ability to hear and create new rhythms. Playing with Jeffries and Branson, she says, has allowed her to regain that ability. Marcy Francis (left) plays the shekere with LaTreice Branson (center) playing the bongos during their Drum Like a Lady performances at the Great Stair Hall at the Philadelphia Museum of Art on Friday, March 29, 2019. In the Grand Stair Hall, the women were warming up. Branson sat and played an experimental cadence. For a minute or two, only the sound of her congas echoed through the hall. Then a young woman in a bright jacket started a complementary polyrhythm on the drum kit; Francis picked up her shekere and rattled in time. Two girls coming down the staircase laughed and began to dance. 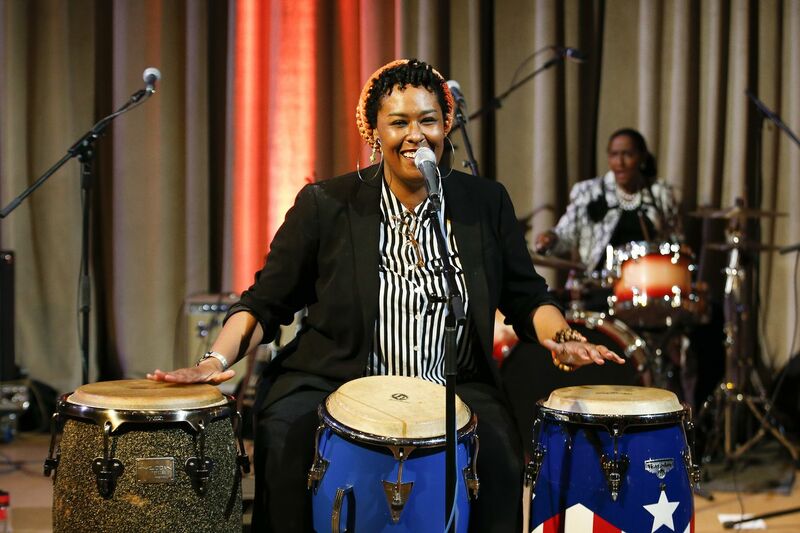 LaTreice Branson plays congas during her Drum Like a Lady performances at the Great Stair Hall at the Philadelphia Museum of Art on Friday, March 29, 2019. Under the spotlight, she appeared even taller than her six feet. She sang, and the room grew silent; she clapped, and every audience member clapped with her; she called people to dance, and teens, children, and married couples made their way up front. She was unfaltering, at least for this night. Every drum in her collection has been gifted into her life. Before she stops drumming, she’s determined to give the way she’s received. That’s why the women of Drum Like a Lady always bring more than they need. LaTreice Branson's Drum Like a Lady performs at the Great Stair Hall at the Philadelphia Museum of Art on Friday, March 29, 2019.